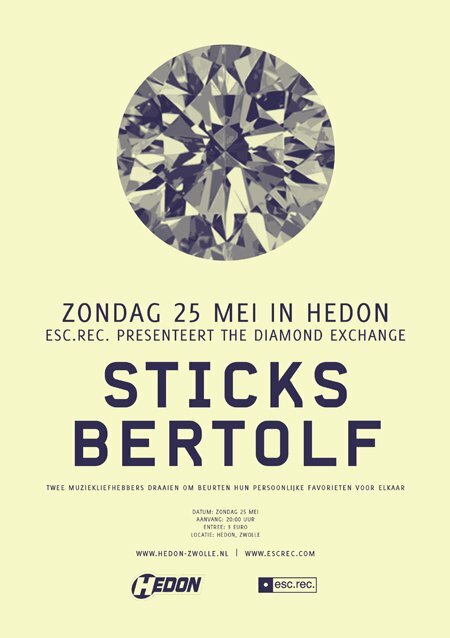 May 25, 2014: The Diamond Exchange in Hedon Zwolle | Esc.rec. Esc.rec. presents The Diamond Exchange. Two passionate music fans take turns in playing their personal favorites for each other, in front of an audience. At best, you witness an exciting, musical conversation between connoisseurs. Depending on the selected participants, that conversation may trigger an audience to listen, dance, or both. No limits, anything goes. This edition is the first in Hedon Zwolle and features two massive local heroes: Bertolf and Sticks! I seriously doubt these two need more introduction, but if for some strange reason you never heard of them, just click on their names to find out more. This edition of The Diamond Exchange should be a very interesting match/clash indeed. I wonder what these two desperately want eachother to listen to!